This entry was posted in art, Artistic Wire, Beadalon, Beading, blog, crafts, creative, handcrafted, jewelry, Julianna Hudgins, seed beads, Wire and tagged Artistic Wire Mesh, Beads, blog hop, blue green orchid, cabana, color, creativity, Jewel Loom, jewels, paint, palm trees, pink, sand, seed beads, surf, Toltec. Bookmark the permalink. What a beautiful, fun, dancing-with-happiness bracelet! I just love it! Oh I am so in that very same dream. Your bracelet is beautiful and really does bring one to that tropical spot. Love it. Debbie your bracelet is beautiful and it does make me think of a tropical island. What a wonderful dream you have. Wow, Debbie, I love the beautiful movement and carefree colour choices 🙂 Beautiful! I was very sad to realize I wasn’t actually on an island…you have such a great imagination and really know how to put colors together. Keep up the good work! Cute design. It turned out very nice. Dreams are important. I want in your dream! Your bracelet definitely moved me to a tropical island on a beach with the sun, sand, & then at night with the moonlight & cool breezes. Wow!! Great job!!! It’s like a happy hula skirt! Love it! What a wonderful dream. Very relaxing. And what a great bracelet. 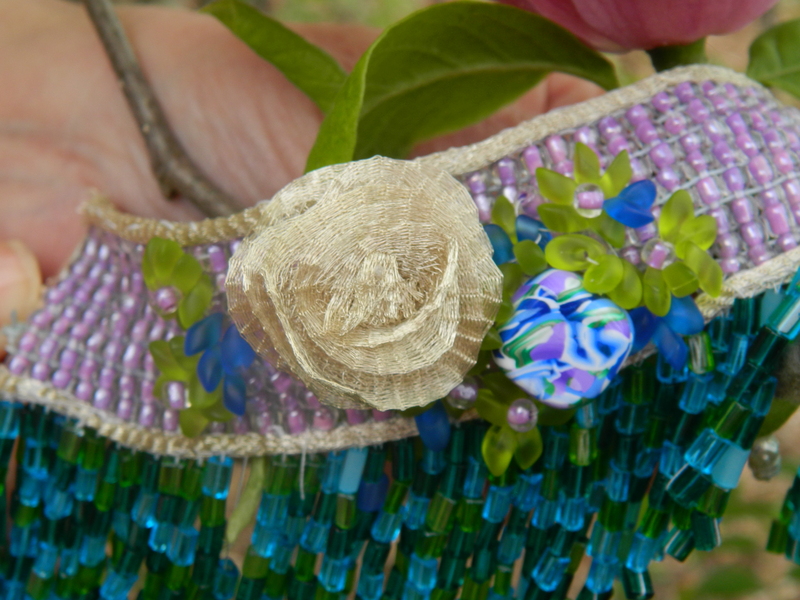 Love the seed bead fringe and the soft, feminine, dreamy colors of it. Very nice. This is just so darn happy and wonderful!!! Love the colors and movement!! Great Job! Have a Blessed Day! Gorgeous bracelet! You totally took me to your paradise with your dream! Fantastic imagery. You remind me of my first few months in Orlando, waking every morning to the exciting thought, “I live in Florida!” and stepping outside to take in the rich sun and ocean air! And again, your bracelet is beautiful. The Jewel Loom is neat! 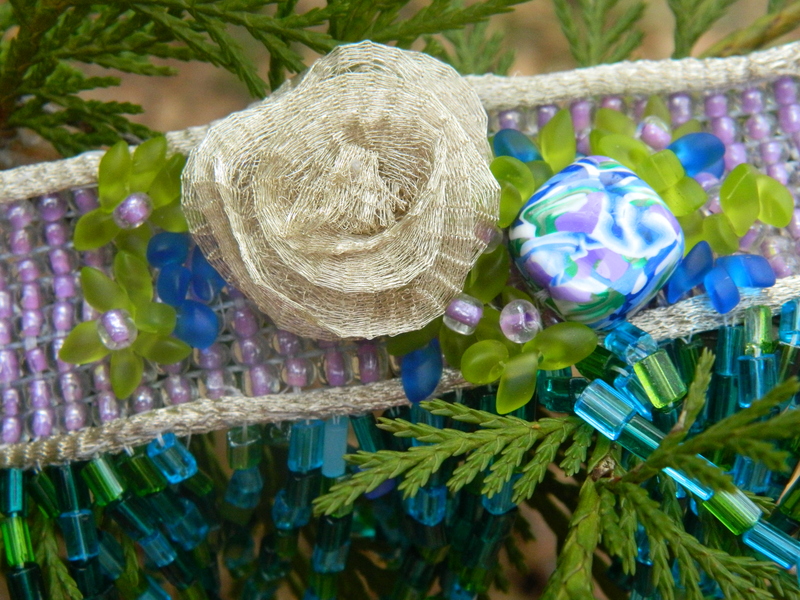 The beautiful lavender weaving is so pretty with blues and greens, and the flower you created with wire mesh is spectacular. Brilliant and fun design, full of tropical soul! Another star of the show! When I close my eyes, I can almost ‘see’ what you tell us about your dream after reading your text … the bracelet shows it. 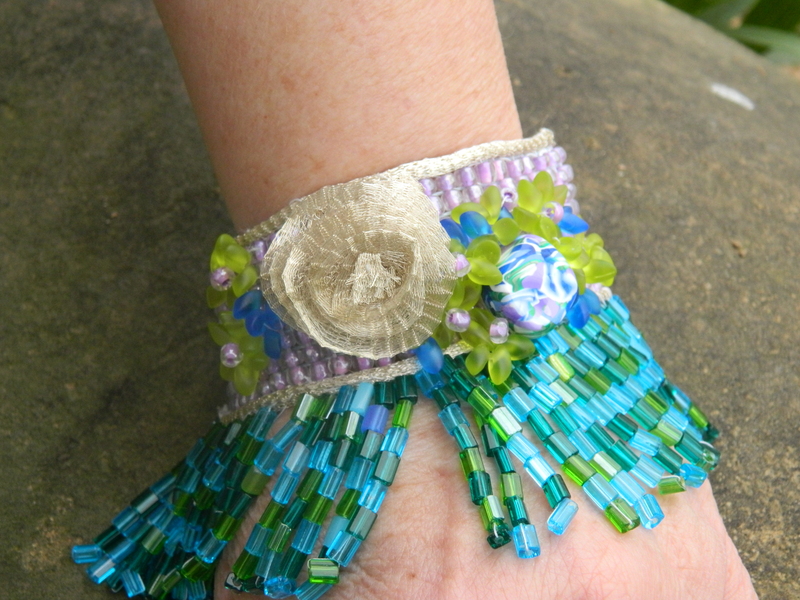 It dances, a happy tropical bracelet in lovely colours! What a lovely bracelet you created ! Sorry this comment took so long, this week has been a little heretic. ooh la la!!! love the great movement and fun this bracelet has to offer. You are very talented and have great imagination. So out of the box!!! Love!! !